From black and white everything to color all over. These days, it seems as if an artist’s aesthetic changes as quickly as the weather. With every new album, artists unleash a whole new world of design and imagery that comes into focus for their anxiously awaiting fans to experience and enter with them. A prime example? Electro-pop princess, Halsey. In preparation for her follow-up to 2015’s BADLANDS, the songstress has taken to social media to reflect the coming of a new era. On Instagram, you can visibly see the artist redefining her look. Nine weeks ago, if you were to look into the singer’s account, you’d see a bunch of live concert stills, celebrity cameos from the likes of Diplo and G-Eazy, along with smoke-filled, Snapchat-filtered selfies. What was left in light of the rebirth of her image was a series of blank white squares and the beginnings of what appeared to be a mood board focused primarily on reds and hints of yellow. While there's no denying that she's back now, the funny thing about this is that it’s becoming a common practice. The songstress is only one of many that have made this very public (and obvious) shift in aesthetic. One band that epitomizes this image overhaul in particular is none other than the pop sensation, The 1975. 2015 was huge for the Brit-rockers. After wrapping up two years worth of non-stop touring across the world for their self-titled debut album, the four-piece also took on a social aesthetic change to tease the release of their highly anticipated sophomore album, I like it when you sleep, for you are so beautiful yet so unaware of it. Previously, The 1975 focused solely on everything black and white, keeping things as sleek, moody, and mysterious as possible. Fans adapted to the stark, monochromatic aesthetic by wearing uniforms of all black to their live shows as a badge of devotion and honor to the band. When the group debuted their saturated, pop-influenced look of neon and pastel pinks and blues to reflect their new sound, fans collectively lost it. The new look didn't just stop on their social media, though—it also showed up in their live sets. Flashback to 2013—the band opted for more of a minimalistic concept. A single white rectangle illuminated the very center of their stages and was surrounded by billowing smoke and flashing white lights. Now, a typical concert from The 1975 in 2016 comes with large rectangular screens projecting lavender, pink, and blue hues in gradient form, along with dreamy, illuminated cityscapes in matching pastel colors accompanied by three suspended rectangles. If we look at this a little deeper, it almost seems like the band is trying to be the polar opposite of their former selves. 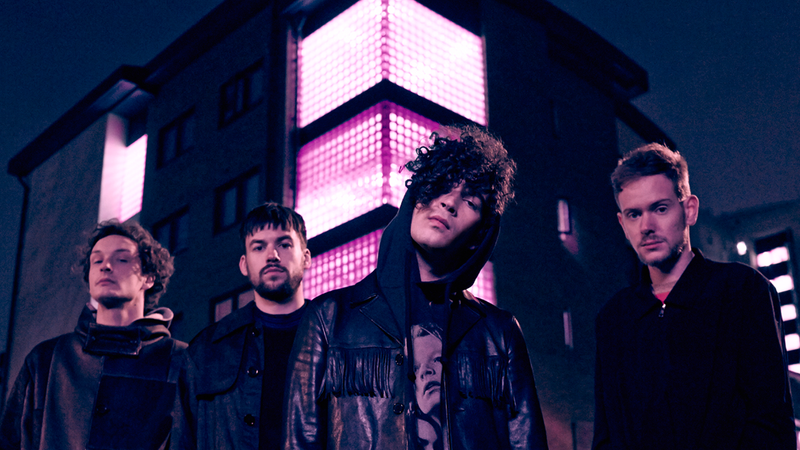 Instead of less is more, The 1975 is starting to think that bigger is better. Or, maybe they just got a little tired of the film noir-esque black and white. Who’s to say? Along with the set changes came a newly found confidence in their voice, with frontman Matthew Healy taking the time out to shout out the real issues that matter, be it religion, the intelligence of their mostly teenage, female fan base, and the brief discussion of the tumultuous state of American politics at last night’s LA show (which was essentially an anti-Trump rant)—all changes that we’re totally down with. As fans, we can’t expect a musician’s image to always remain the same. And sure, when they undergo reinvention, it can be hard to process. But aren’t these the traits that make following our favorite artists fun and exciting in the first place? A band’s evolution is the very thing that keeps us on our toes and constantly craving more. So next time your fave goes on a total image overhaul, take it in stride, because admit it—you can’t have enough 1975 merch.